This script allows you to create splash screens using events. When the player launches your game, a special “splash screen map” will be loaded and start running. You can use events in this splash screen map to set up your opening sequences, such as any splash screens using “show picture” events, animations, messages, screen fade-in fade-out effects, and so on. You can create unique splash screens with no scripting knowledge required! 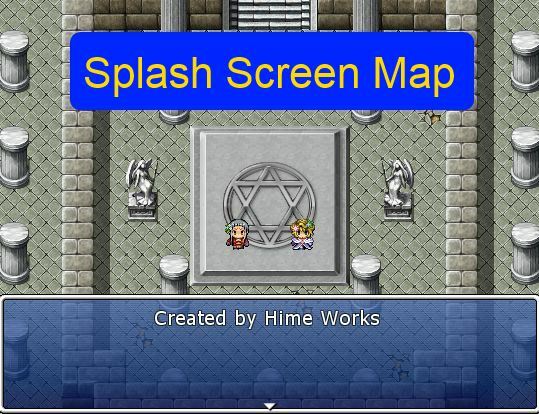 splash screen map, and then just set up your scene in the selected map. Is there a reason why my menu button wouldn’t work after installing this in? I set the script up correctly, however it seems that a game with the 640×480 resolution doesn’t allow this script to function correctly. Nothing comes up except blackness. When I tested it in a new project with the default res, it worked. Is there a way to allow this script to work with the expanded resolution? Thanks in advance! I just tested it on 640×480 and it seems to work. There may be another script that’s causing the render issue. Ughh I just replied and it deleted it for some reason. Before we begin, if you don’t want your site getting clogged helping me out, we can take it to E-mails or something if ye prefer. Anywho, I had changed it to my splash screen name and it didn’t work. So I did what you said here and tried something, its the second map I made on the test map, so I named it =2…and it worked!! Thanks a lot! Just two more questions for now. #1 How do you get it to change from the splash over to the Title Screen, and #2 is there any way to make the text scroll Center Line, and change the Font, to something like Old English etc. You can create an event that will run automatically on that test map, and in the event you can show a message, or maybe a picture. A picture would be easiest since then you could just have the picture scroll across the screen, and just set up your picture with the text you want to show in an image editor. Good idea, I implemented a scrolling picture, granted you can tell where the dividing line is if you look close enough, but I’m not worried about that. Point is, that worked, used my custom font and everything. Now the deal with it moving to the Title Screen. I cannot for the life of me, get that to work. I changed the skip button to :enter and under SceneManager.goto(Scene_Title) in your script, I’ve tried leaving that as it is, and I’ve tried changing it to the title of my game SceneManager.goto(DWO2) and that didn’t work either. :/ I must be doing something wrong here. There is an event command called script call. You should use that. Sorry back now, been real busy around here. If you want to take this to E-mails or whatever you prefer, so its not clogging up your site here we can. Ahhh! Got it to work! Thanks 🙂 Two questions though. How do I get the splash to skip, or once it finishes to go to my title. I tried changing the (Scene_Title) to my Title screen, it just keeps looping, and is there any way to wrap the text so its in line like Center Text in documents? Also change the font to Old English, or just in general. I tried playing around with the text mechanism but it either doesn’t allow it, its something that has to be added through scripting or I am missing something. This is a fantastic script, its exactly what I was looking for. However there is just one problem, me, I’m no greenhorn when it comes to video games, been playing and working with them forever. But I am just terrible at scripting, can’t get any of them to work, all I hear is that ping, ping sound followed by a “can’t find this file,” or “error – blank blank” etc etc. I am so in the dark on scripting I don’t even know what exactly to ask to fix mine. Basically all I’m looking for (non commercially for now) is to semi-replicate many of the functions of Dragon Warrior. Not exactly, as I’ve seen others do that, but just the scripted confusing parts, command prompts, title splashing etc. In my variation of it, the screen starts off with a scrolling (Star Wars) type dialog explaining a rough draft of the story, and from there I wanted it to jump to the custom title screen I created. Can you explain what the issue is? Are you not sure how to install the script? Or nothing happens when you enter the game? Lets see. Well to my knowledge anyways I installed it properly, at least I think I did. I followed the instructions you had there. I inserted the script right under Materials. Then I tried it without changing anything, nothing happened. Said file not found. So from there, I did what you said and changed the (scene_title) to my games title. To end it to swap to the Title Screen…but come to think of it. What did you mean about the Set the ID of the map under Config for the Splash, and the whole camera positioning deal? I’m using RPG Maker VXAce if I didn’t al…ahh I see I did, at any rate, yes that’s what I’m using. Also thanks for the swift reply, I have been on many of these forums and heard not a peep from the people there over my inquiries. Forgot to add my name last time. But I was going to say, I found the config section in your script and tried changing it to my map. It said Name Error: Line 66 Uninitialized constant (etc etc). Yes, those configuration settings are important. In my scripts (and several others), there is a “script configuration” section which is just a portion of the code script that is dedicated to “settings” that the user can change as needed for their project. This is a configuration option that tells the script to use map 5 as the splash screen map. If you wanted to use map 1 as your splash screen test, you would change the 5 to a 1.